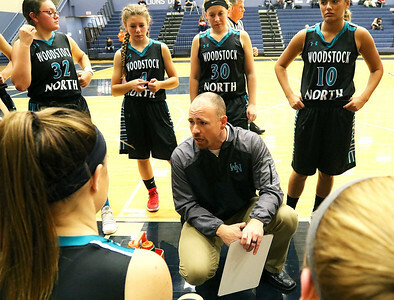 H. Rick Bamman - hbamman@shawmedia.com Woodstock North head coach Mike Lewis plans a play with his team during a fourth quarter time out against Willows Academy in the Bill Knox Thanksgiving Invite on Wednesday, Nov. 15, 2017 at Harvest Christian Academy in Elgin. H. Rick Bamman - hbamman@shawmedia.com Woodstock North defenders Taylor Prerost (left) and Hanna Sells sandwich Willows Academy's Kailey Mongoven in the fourth quarter during the Bill Knox Thanksgiving Invite on Wednesday, Nov. 15, 2017 at Harvest Christian Academy in Elgin. 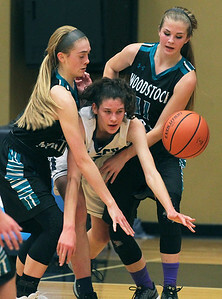 H. Rick Bamman - hbamman@shawmedia.com Woodstock North's Amaya Saldana drives through a Willows Academy defender in the Bill Knox Thanksgiving Invite on Wednesday, Nov. 15, 2017 at Harvest Christian Academy in Elgin. 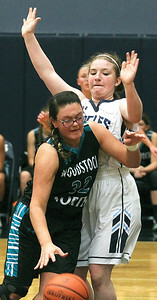 Woodstock North's Amaya Saldana drives through a Willows Academy defender in the Bill Knox Thanksgiving Invite on Wednesday, Nov. 15, 2017 at Harvest Christian Academy in Elgin.